Advertised as “old-fashioned” and “the mattress maker’s mattress company,” Spindle offers an adjustable natural-latex mattress made of 3 layers of Dunlop latex. Spindle was founded in 2013 by Neal Van Patten, a 4th-generation mattress maker. Patton set out to build a customer-centric, online, latex mattress company, and sell at an affordable price. Spindle is a direct-to-consumer company whose mattress is priced below the average for latex models. They’ve sourced their materials from within the US, and the company is headquartered in New England. This modular mattress consists of three 3” layers of all-natural latex topped with a 1” fire-safe layer of natural-wool batting. Customer service: Spindle describes itself as customer-centric, and customers rave about the treatment they’ve received both during and after the sales process. Shipping issues or minor mistakes have been handled directly by the company founder, and stories of the helpful nature of company staff abound. Comfort level: Sleepers can customize the Spindle mattress in what’s often described as a simple process of rearranging the layers. Finding the right comfort layer does not entail sending the mattress back to the company for replacement. Instructional videos on the website explain to buyers how to adjust it to their needs. The company also offers a topper for those who still need more softness. Quality materials: Spindle has gone to great lengths to use all-natural materials which conform to safety standards and meet up to certification standards as well. The company gives explicit specifications on the website, details each material and its source, and often links to the companies that make the material. The mattress is ultimately assembled in New England with materials from all over the US. Body impressions: Although the company warranty covers impressions greater than ¾” (the standard is 1”), with this material the occurrence of body impressions is to be expected over time. Weight: Latex is heavy and this one is no exception. The company will send the mattress in 2-3 separate boxes, which helps with initial portability. Some have described the process of assembling the layers at home as frustrating because of its overall weight. Others have been able to handle the task in 15 minutes, however, so experiences will vary. Bounce: Like all latex, this mattress does provide a certain degree of bounce. If you’re a sleeper who dislikes this feature, latex is not your best option. Buy your Spindle mattress from Amazon. Spindle began in Massachusetts in 2014. Neal Van Patten, Founder and President, has been involved with the mattress industry for over 20 years. He grew up in his family business, WJ Southard, and then went on to work for companies such as Simmons and Sealy. His industry experience includes everything from research and design to sales. Patten decided to strike out on his own and apply this experience to making an affordable but high-quality latex mattress available online. Spindle receives an A+ rating from the Better Business Bureau. No complaints have been filed. They feature over 500 5-star reviews on the company website at this time. The brand sells on Amazon, and is reviewed on Yelp, but features very few reviews on either of those sites. The young company has not received coverage in the press at this time. Based on the limited customer feedback available, customers are quite satisfied with the Spindle mattress. They especially emphasize the helpfulness of the Spindle team in addressing any concerns or issues that arose during the buying process. Most customers report satisfaction with the value received for the price as well as with the overall quality of the materials. The Spindle mattress has a modular design, which allows it to be shipped in 2-3 separate boxes and assembled according to your comfort-level preference. Instructions are available online in video format to guide you through the process. This mattress consists of 100%-natural latex made by Mountain Top Foam and a layer of eco-wool. The cover material is made from natural organic cotton. Latex layers: Three layers of 3” Dunlop latex. This latex is 100% natural and Oeko-Tex Certified. Wool layer: 1” of natural wool batting covered with organic cotton. The wool comes from sheep raised in Northern California and Oregon. Cover: Organic-cotton twill quilted with eco-wool. The term eco-wool refers to the wool from sheep raised on farms which use organic practices, but choose not to go through the expensive steps of becoming certified. The sides of the cover are cotton canvas. Purchase the Spindle mattress from Amazon. Spindle has a unique approach to the now-conventional mattress sleep trial. The short answer to the question of a sleep trial, when posed to the company, is that they don’t have one. 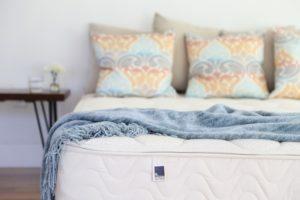 When explored further, however, it seems that Spindle’s policy is to make every attempt to build a mattress that suits you, and then help you make adjustments if needed. They encourage you to try out other latex mattresses in your area, invite you to send pictures and brand names of any mattress you like, and state that with many latex mattresses, “the similarities will considerably outweigh the differences.” Spindle’s candid, transparent approach to mattress sales is evident in their return policies. After a 30-day adjustment period with the new mattress, customers are asked to call Spindle if they find it either too soft or too firm. A topper ($200) or an extra layer of latex ($150) are sometimes recommended, but efforts will be made to help sleepers adjust the bed by changing the arrangement of the layers. If all else fails, and within a year of the original purchase, the company will refund all but $300 of the purchase price as long as buyers provide proof that they’ve donated the mattress. Mattress labels must be removed and sent with a letter stating that all steps have been followed before a refund will be issued. Spindle does not offer a removal service. Shipping is free in the continental US. As previously mentioned, the mattress will arrive in 2-3 boxes. Following instructions provided, customers assemble the individual layers upon arrival. The assembled mattress will weigh anywhere from 95-180 pounds. The company uses UPS for shipping and recommends that you enroll in UPS My Choice before ordering to control delivery dates and/or times. Although they offer what appears to be a standard 10-year limited warranty, Spindle spells out in great detail on the website exactly what that means. The warranty covers manufacturing defects and body impressions over ¾” and states that the company will replace defective materials. Spindle also offers a 25 Year Comfort Life Program. This program makes it possible for buyers to purchase replacement parts for their mattresses. The company states that prices for these parts are “substantially below what you’d pay under typical pro-rated terms,” but does not advertise the prices. Motion transfer will be minimal with the Spindle mattress. While latex is springy and responsive, providing more bounce than memory foam, it still absorbs energy well and allows for a peaceful sleeping experience. Edge support rates fair to good with this mattress, and edge sleepers should feel adequately supported. Again, compared to solid memory foam, the Spindle latex provides more strength and holds it shape better. Natural latex should typically last 5-10 years longer than poly-foam. This company’s claim to all-natural is accurate, according to the detailed specifications provided on the website. The quality of the materials used in each layer should enhance the longevity of the Spindle mattress. The company is simply too new to have reliable data on lifespan, however. The company offers soft, medium, firm, and extra-firm options. The Spindle brings all the benefits of high-quality latex, along with the bonus feature of allowing you to rearrange the layers to better suit your needs. Latex can seem like the best of both worlds for many because it offers support and quick recovery, while still contouring to your body and providing adequate pressure relief. This mattress offers the typical even-temperature sleep experience found with latex foam. It stays cool in the summer and warm in the winter. The materials have been designed for enhanced airflow so that body heat is transferred away from sleepers. Wool is known for being a highly breathable natural material. Spindle’s use of all-natural materials is a plus in that you’ll notice no chemical odor, even fresh out of the box. Customers have no complaint about any lingering smell. Once set up, the mattress is ready to sleep on. Response time is great with the Spindle, and you won’t feel stuck in this mattress. Spindle’s latex layers offer enough bounce to make movement easy and enough strength to provide solid support. Most of the care guidelines provided by Spindle relate to supporting your mattress. They warn that traditional box springs won’t provide the necessary support for this heavier latex. Spindle recommends a solid foundation such as a box foundation, a platform bed, or an adjustable bed. They offer detailed guidelines on the website for varying types of support, and will recommend modifications to a foundation you have at home. It’s important to keep latex dry, so a protective mattress cover is recommended. Baking soda and vinegar mixed with water make a good mild cleanser for gentle spot-cleaning. Soaking the mattress creates the possibility of mold damage.